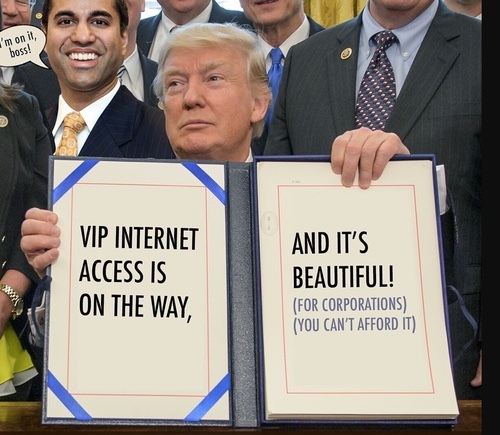 Under FCC chairman Ajit Pai, the United States is -- as President Trump might say -- winning bigly. By whose measure? Because of Title II's demise, the market is "already responding to the more deployment-friendly regulatory environment now in place," the report says, ignoring the fact that many broadband deployments actually began in 2015 -- long before Trump or Pai governed, as an Ars Technica piece details. "For example, WISPA states that the current speed benchmark of 25 Mbps/3 Mbps enables Americans 'to watch Netflix, play video games and browse online without interruption even if a couple of devices are on the same connection." This is a dig at the government for using a standard that an industry organization demonstrates is not capable of handling the modern household's connected needs. To meet demand and drive the economy forward, fulfill residents' educational requirements and ease the burden on the healthcare community while reducing costs and improving outcomes via telemedicine, broadband service must be built to a higher standard. Even if the entire country was blanketed by 25/3 coverage, the US wouldn't be winning bigly. To truly make America Broadband great, it needs nationwide symmetrical speed capable of doing all the amazing things people want to do while connected -- from transmitting cat videos to CAT scans and everything in between.